Crafted from stunning marble-effect stone, an eye-catching addition to any small space. In various colours. 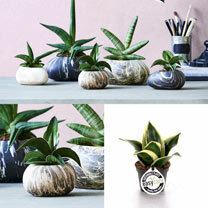 The 13cm planter fits 6cm potted plants. 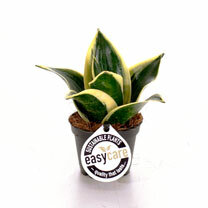 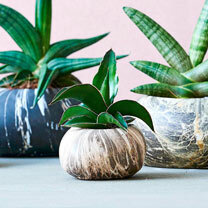 PLUS pick your FREE 6cm plant from - Sansevieria Trifasciata Black Jade, Sansevieria Trifasciata Jade Pagoda, Beaucarnea Recurvata, Sansevieria Cylindrica Braid or Sansevieria Cylindrica Fan.